In a finding that sheds new light on the neural mechanisms involved in social behavior, neuroscientists at the California Institute of Technology have pinpointed the brain structure responsible for our sense of personal space. "SM is unique, because she is one of only a handful of individuals in the world with such a clear bilateral lesion of the amygdala, which gives us an opportunity to study the role of the amygdala in humans," says Kennedy, the lead author of the new report. During his years of studying her, Adolphs also noticed that the very outgoing SM is almost too friendly, to the point of "violating" what others might perceive as their own personal space. "She is extremely friendly, and she wants to approach people more than normal. It's something that immediately becomes apparent as you interact with her," says Kennedy. 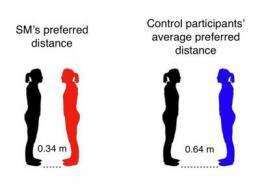 Intrigued by SM's unusual social behavior, Adolphs, Kennedy, and their colleagues devised a simple experiment to quantify and compare her sense of personal space with that of healthy volunteers. Among the 20 other subjects, the average preferred distance was .64 meters—roughly two feet. SM's preferred distance was just .34 meters, or about one foot. Unlike other subjects, who reported feelings of discomfort when the experimenter went closer than their preferred distance, there was no point at which SM became uncomfortable; even nose-to-nose, she was at ease. Furthermore, her preferred distance didn't change based on who the experimenter was and how well she knew them. "It was just the idea of another person being there, or not, that triggered the amygdala," Kennedy says. The study shows, he says, that "the amygdala is involved in regulating social distance, independent of the specific sensory cues that are typically present when someone is standing close, like sounds, sights, and smells." The researchers believe that interpersonal distance is not something we consciously think about, although, unlike SM, we become acutely aware when our space is violated. Kennedy recounts his own experience with having his personal space violated during a wedding: "I felt really uncomfortable, and almost fell over a chair while backing up to get some space." One explanation for this variation, Kennedy says, is that cultural preferences and experiences affect the brain over time and how it responds in particular situations. "If you're in a culture where standing close to someone is the norm, you'd learn that was acceptable and your personal space would vary accordingly," he says. "Even then, if you violate the accepted cultural distance, it will make people uncomfortable, and the amygdala will drive that feeling." The findings may have relevance to studies of autism, a complex neurodevelopmental disorder that affects an individual's ability to interact socially and communicate with others. "We are really interested in looking at personal space in people with autism, especially given findings of amygdala dysfunction in autism. We know that some people with autism do have problems with personal space and have to be taught what it is and why it's important," Kennedy says. He also adds a word of caution: "It's clear that amygdala dysfunction cannot account for all the social impairments in autism, but likely contributes to some of them and is definitely something that needs to be studied further." More information: "Personal Space Regulation by the Human Amygdala," Nature Neuroscience, August 30, 2009. This is utter nonesense. Cultures have unique perceptions of personal space. The caucasians, for example, love hugging and touching each other, even in between strangers. Some other cultures find it polite to stand close to the person you are talking to, and, yes these things are habitual, but why assume that humans prefer to have personal space naturally, and not the other way round? Perhaps it's western culture that shapes its youth to demand personal space, while other cultures follow natural behavior? And to boot, they had a testing sample of 20 people! Nineteen, furthermore, were used as a baseline, and the entire study is based off the fact the the last one hapenned to have a brain disfunction. I think this is more correlation than causation. I think, that this radius might have something to do with the length of hand. You don't feel so secure if somebody is in the reach, unless the other person is someone to whom you are 'close'. Great, I'm going to get a 'stop-distance' beeper on me set to my preferred spatial distance to keep close-talkers at bay. Neuroscientists find brain region partaking in our sense of personal space. From what I've learning the amygdala is mainly a switching board. That was pretty stunning. A woman with brain lesions (damage) used to explain behavior is defined if autism is diagnosed as dysfunction, instead? Is there a vocabulary problem here? anyone examine the intended subjects of research for lesions or is it just assumed their brain is whole, undamaged, and skewed in response because someone saw a set of symptoms that match a page in the DSM? Isn't it pretty ridiculous to attribute abnormal proximity to assumed brain dysfunction when the individual doesn't have a clue what social proximity even is? 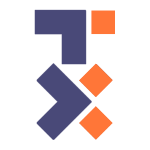 (See DSM for details on social development). How about NOT assuming the person with autism is whole, healthy, completely aware of social norms and expectations before setting up a study that makes those assumptions? It's really, REALLY hard to come up with good stats when the bias screams out like a banshee. "The caucasians, for example, love hugging and touching each other, even in between strangers." Caucasians is too general. I hate to argue, but while I have seen your suggestion to be true in most of Europe, Americans tend to distrust strangers as a rule. I have travelled most of the country, and my experiance as a young female on the road (on business, not road-tripping) refutes your statement. In the north-eastern part of the country at least, you don't see people saying "hi" to someone they don't know just to be neighborly or friendly. And normally "Excuse me" or "Sorry" don't include eye contact. Alot of people are even reluctant to shake hands when being introduced; they suffice with a nod and, at times, a reluctant smile. IE: The article is Not about the normal person's preference, but about how the brain damage affects SM's conduct. Its point is to present findings that "suggest that the amygdala, because it is necessary for... strong feelings of discomfort..., plays a central role" in some of our social interaction.